Credit Card Applications » Research » Infographics » Traveling with Credit Cards » Credit Cards and Car Rentals – Are You Really Covered? 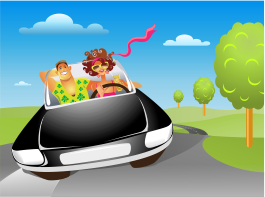 Renting a car is a rite of passage – you only have to be 18 to vote and 21 to buy booze, but most places won’t rent a car to anyone under 25 years old. Not only that, you’ve got to have a credit card. The first time I rented a car, on vacation in Hawaii and feeling very adult, my uncle advised me not to fall for what he called “the rental car insurance scam.” He said that the credit card I used to pay for the car would provide insurance coverage, so I wouldn’t need it from the rental company. Enterprise - $9 a day for Loss Damage Waiver and Collision Damage Waiver combined, $14 for SLI, and $2.5 for Personal Accident Insurance and Personal Effects Coverage. If you want all of it, you'll pay $25 a day – more than half of the $48 per day cost of renting one of their mid-size cars. Dollar, Budget, and Alamo offer similar rates for this coverage, only varying by a dollar or two per day. I felt like I’d been let in on a secret, and confidently refused insurance coverage anytime I rented a car from then on. So, was my uncle right? Does your credit card really provide all the coverage you need when you rent a car? Nobody wants to bother reading the fine print on credit card agreements and rental car terms – but that’s what we do for you here at Credit-Land.com every day. We’ll help you decide what coverage you need, and make sure you’re really getting what you think you’re getting. To weigh the details of which types of vehicles are covered, for what time period, any geographic limitations, and other important details, check out Credit-Land.com’s handy Guide to Credit Card Rental Car Coverage infographic. So, credit card coverage includes damage and theft, but it does not cover personal injury, liability, or property. It also does not cover any driver who is not authorized on the car. Only the people named on the car rental agreement are covered. Also, certain types of vehicles aren’t covered – usually trucks, campers, and other specialty cars won’t be covered. Comparing with our side-by-side review of U.S. Car rental services, the only two items covered by any credit card rental insurance are LDW and CDW – car theft and damage. Supplementary coverage, personal coverage and medical coverage are not included in standard credit card rental car insurance agreements. SLI, PAI, and PEC are not included. Only one card – American Express – offers a premium rental car insurance option that you can purchase. This insurance covers medical expenses as well as the usual LDW and CDW up to $100,000 – and the $24.95 fee is per rental period, not per day. American Express is known as a premium card for travelers and having access to deals like this is one of the ways being an AMEX cardholder pays off. To choose or not to choose Credit Card Rental Protection? Credit card car rental insurance is always considered secondary coverage – it covers you if you don’t have other car insurance or if you do not purchase insurance from the rental company. A very important thing to know is that with any credit card rental insurance, buying the coverage from the rental company will invalidate your credit card insurance coverage. You can’t get coverage from both sources at once. However, if your personal car insurance has a deductible, then your credit card will cover that amount. Keep in mind, although your rented vehicle is protected, you will need a separate insurance to cover possible liability damages you may cause to the other vehicle or property involved in the accident. As always, the best solution is to be careful while driving. With that in mind, happy - and safe! - driving to you. You are correct. Will fix this ASAP. If I rent a car using points and pay the taxes etc. using AE card which has premium protection enabled, will I still be eligible for premium insurance. There is a mistake in this. AMEX does not cover liability. Even their website points this out in the FAQ. Thank you for pointing this out! Will update it ASAP.